Danzo is one of the famous elder of Village Hidden by Leaves. He is also the founder of Root and was appointed as Sixth Hokage Candidate during the Kage Summit. He died in a battle with Sasuke at the Samurai Bridge. He has implemented so many eyes of Uchiha and had the ability even to control Jinchurikis. Danzo even destroyed Shisui’s eye before dying to make sure Masked Man (tobi) doesn’t get his hand on it. Let’s take a look at the abilities of Danzo Shimura. Ninjutsu Izanagi [Prompt]: Launches Izanagi on a selected friendly unit, lasts for 1 round and cannot be cancelled or dispersed. Units under Izanagi’s effect will escape damage that would defeat them, moreover, they will recover 80% of their Life. Taijutsu,Ninjutsu Wind Chakra: Attack 3 units at the front at random and has a chance of Repulse. Repulsed units will cause damage to the row behind them. Ninjutsu Koto Amatsukami: Launch Koto Amatsukami barrier. At the beginning of a battle. Increases Attack and Ninjutsu for all ninjas with Fire and Lightning attributes from your team by 40% if a barrier is activated. Causes Chaos to 1 of the opponent’s units each round. Taijutsu,Ninjutsu Wood Style – Root Explosive Entombment: Chases and Attacks a Repulsed unit, causes Knockdown and Immobile. Ninjutsu Ambition: Every time a unit is defeated, this unit will recover 10 Chakra and 10% of its Life, this can be triggered 6 times each round. You can get Danzo Shimura from the Kage Treasure. You will need to draw 60-70 seal scrolls from Kage treasure to get Danzo. 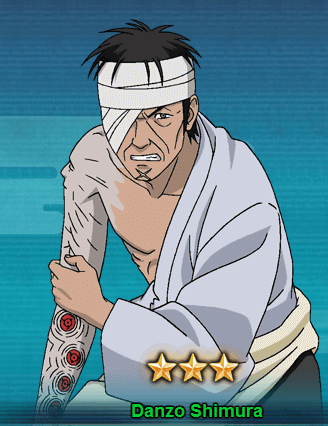 Danzo will be a great addition to Lightning and Fire Main teams.